(Nanowerk News) A major hurdle in structural biology and pharmacology is growing crystals to determine the structure of the biomolecules and pharmaceuticals under study. Researchers at the University of Tübingen, working with colleagues from Oxford and Grenoble, have now observed a key step in the nucleation and growth of some protein crystals. For this, they exploited the power of in-situ real-time X-ray scattering techniques. Their study, published in the latest Journal of the American Chemical Society ("Real-Time Observation of Nonclassical Protein Crystallization Kinetics") could help to gain a deeper understanding of protein crystallization and its kinetics on nanometer length scales. 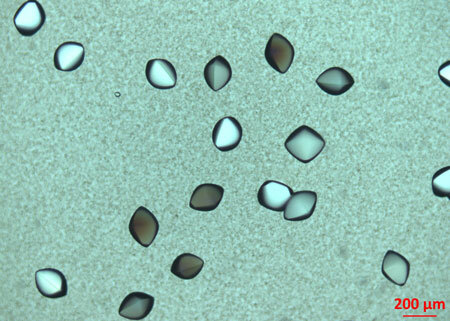 The researchers observed a multi-step crystallization mechanism. First, an intermediate phase consisting of aggregates was formed, followed by the nucleation of crystals within the aggregates. The nucleation rate was proportional to the amount of the intermediate phase, consistent with the appearance of a local maximum in the crystallization rate at the maximum quantity of the intermediate. The researchers found, however, that the crystal growth rate was low initially, possibly due to the low mobility of proteins within the aggregates. This step lasts until the intermediate phase is consumed by crystallization, then crystal growth becomes faster as proteins in the dilute liquid phase can diffuse to and incorporate into the growth front directly. In contrast, the nucleation rate is significantly reduced in this stage, which further demonstrates the role of the protein aggregates as the precursor of a two-step nucleation process.